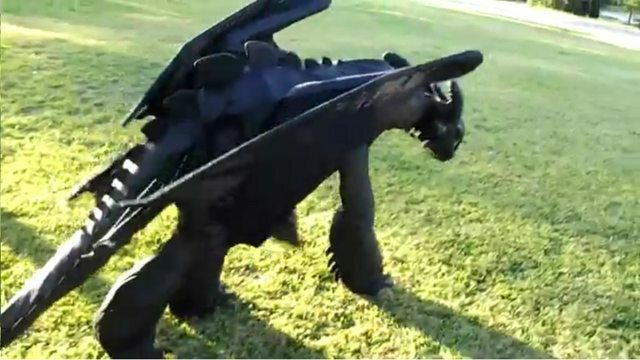 A great costume of Toothless from How to Train Your Dragon. These videos show the mobility and features of this quadsuit, which has lots of new ideas not seen in other quads. Fabrication: It was built with a special PVC frame with full harness unit, moving pivot neck, double jointed stilts for extra movement, fully detachable as the wings/tail/arm stilts and back feet can be detached for packing. The person inside can be on all fours or switch to being on 2 legs. A 4″ cpu fan kept cools the suit. The skin material is jo-ann fabrics and a micro-suede material, claws are molded from featherlight plastic, large spines are sanded down foam mat material. The suit is not for sale. Do want one of my own, granted, I don’t think I’d have the muscle strength required for a quad, so I’d be an anthro Toothless. Does anyone have the contact information for the person who created this costume? It is awesome! How do you get one of these ! I would kill for one not really but I want one so badly !!!!!! !